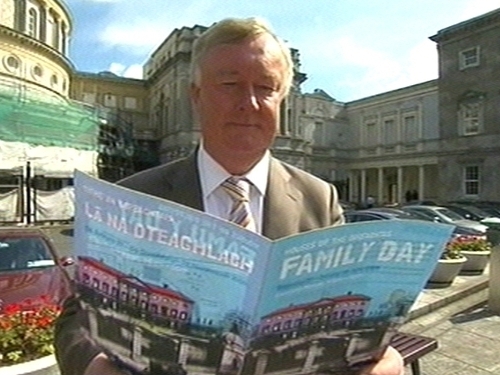 Members of the public have visited Leinster House as part of the Houses of the Oireachtas Family Day. The event, which is in its second year, included public tours and re-enactments of famous speechs. A total of 8,000 tickets were made available to members of the public to visit Leinster House this weekend and were booked up with 24 hours. The ticket holders had an opportunity to go into the Dáil and Seanad chambers and tour the historic corridors of Leinster House. There is also a photo journalism exhibition commemorating 90 years of Dáil Éireann. Ceann Comhairle John O'Donoghue says the level of interest in the Family Day makes a clear statement that people do wish to connect with their parliament, their politicians and the political process.